Maintenance work on the MetroLink system scheduled November 2-8 may result in delays for some Red Line and Blue Line MetroLink passengers. 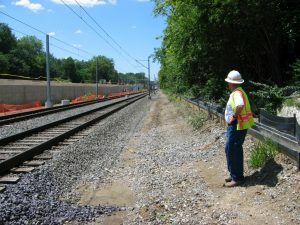 To accommodate crews, MetroLink will operate on a single track at the Forest Park-DeBaliviere, Central West End, Union Station and Civic Center MetroLink Stations next week. In addition, Blue Line trains will only operate between the Shrewsbury-Lansdowne I-44 and Forest Park-DeBaliviere MetroLink Stations after 8 p.m. from Monday to Friday and from the beginning of service until the end of service next weekend. On Monday through Friday (November 2-6) from 8 p.m. until end of service, MetroLink will operate on a single track at the Forest Park-DeBaliviere and Central West End MetroLink Stations, and Blue Line trains will only operate between the Shrewsbury-Lansdowne I-44 and Forest Park-DeBaliviere MetroLink Stations. On Saturday and Sunday (November 7 & 8) from the beginning of service until end of service, MetroLink will operate on a single track at the Union Station and Civic Center MetroLink Stations, and Blue Line trains will only operate between the Shrewsbury-Lansdowne I-44 and Forest Park-DeBaliviere MetroLink Stations. This rider alert does not give an accurate assessment of how this will effect ridership- in fact its downright misleading. You need to let people know that thier commutes will be 2 to 3 times the ammount of time they are used to, because that is the reality of the situation. The fact only one train is operating, and it is going to be late as well is a smack in the face to every person who depends on Metro. I understand that maintenance is needed, but for a city that has very little train service- it seems to always need maintenance. And you never compensate for connection times, which is really what effects people. Please do better. My half hour commute home should not take and hour and 20 minutes because of a little construction. Josh, I will forward your feedback to MetroLink operations for review. We are always balancing how to maintain the current state of our MetroLink system (some sections are now more than 22 years old) and how this needed maintenance impacts the passenger experience. I agree, there’s always room for improvement. Thank you again Josh for your feedback. Sorry about the inconvenience. Until Metro analyzes the connection caused by single tracking. I would suggest that you catch the train prior to the one you normally catch. Or in the case of the bus, catch the bus earlier. It’s a little inconvenient but you will make it on time to your destination.